"A country, vegan, root-vegetable lentil soup perfect for that cold October night snugglin' and nuzzlin' up with your hubby or wifey. A lil' Johnny Cash or Zac Brown in the background won't let ya down! Root, hog, or die with this-a-here rootin', tootin', high-falutin' superfood soup! Serve over quinoa or basmati or brown rice." 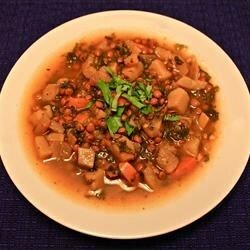 Combine the potatoes, spinach, carrots, turnips, garlic, and lentils in a slow cooker. Pour enough water over the mixture to cover. In a bowl, stir the fresh basil, chili powder, cinnamon, dried basil, paprika, turmeric, cayenne pepper, ground ginger, sea salt, and black pepper; stir into the slow cooker. Cover the cooker, and cook on High for 8 hours. Cook on High from the time you finish your morning coffee 'til the time you open up a bottle of red wine. Substitute organic ingredients where possible. Fantastic!!! Made according to recipe instructions except I added 1/2 onion and 2 veggie boullion cubes. Served with naan and Little Penguin Shiraz. Great stew for a healthy appetite. Photo attached.